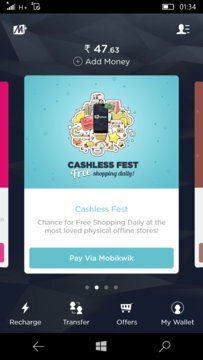 Published by One Mobikwik Systems Pvt. Ltd.
MobiKwik provides India's best Mobile Recharge and Bill payment experience on the go. • Recharge mobile and pay bills. • Online shopping on various merchants (eBay, BookMyShow, Dominos, redBus, etc.) and avail exclusive offers. • Online Money transfer to your friends and family. - PREPAID mobile recharge for Airtel, Vodafone, Reliance, Idea, BSNL, Tata Docomo, Aircel, Loop Mobile, Uninor, Videocon and MTS. 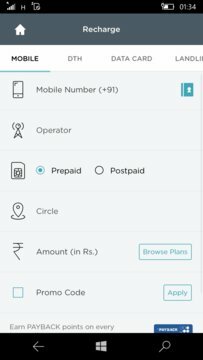 - POSTPAID mobile bill payment for Airtel, Vodafone, Idea, Docomo & Reliance. - DTH (Satellite TV) recharge for Tata Sky, Dish TV, Sun Direct, Airtel DTH, Videocon D2H & Reliance Big TV. - DATA CARD recharge for Tata Photon, MTS MBlaze, Reliance Netconnect & Idea Netsetter. - ELECTRICITY Bill Payment for NDPL, BSES Yamuna, BSES Rajdhani, Reliance Energy & MSEB Mumbai. - LANDLINE Bill Payment for Airtel, MTNL, Reliance Communications and Tata Communications. - GAS Bill payment for Mahanagar Gas Limited. - LIFE INSURANCE Policy payment for ICICI Prudential, IndiaFirst, Tata AIG and Birla SunLife. • MobiKwik mobile recharge app for Windows Phone is small size, fast and light on your mobile phone and bandwidth consumption. Works very well on 3G as well as 2G connections. - Park money into your MobiKwik wallet and make simple, fast, hassle free payments without hopping between merchants, payment gateways, banks, then back, then back. Pay in one click! - Lots of payment options including SBI (State Bank of India) , HDFC Bank, ICICI Bank, Axis Bank. Whether you use credit card, debit card or Internet banking we support them all. Visa, MasterCard, Maestro, Diners & Discover cards are all supported. - Directly pick contacts from contact list to recharge. - Browse Plans of mobile operators for Airtel recharge, Vodafone recharge, Idea recharge, Docomo recharge, Reliance recharge, Aircel recharge, BSNL recharge, MTNL recharge etc. Try the best App for Mobile Recharge now! For any queries or help, please file a ticket from the app itself by visiting "Help". We'll get back to you within 24 hours.